Surah Muḥammad (Arabic: سُـورَة مُـحَـمَّـد‎, "Chapter of Muhammad") is the 47th surah of The Holy Qur'an with 38 ayat. This thirty-eight verse chapter was revealed in Medina. It is generally understood that Median chapters focus on the establishment of a functioning Muslim society. This one is no different and tackles several subjects including war, what happens to those who try to prevent others from converting to Islam and the futility of opposing God and His Prophet. At the time of revelation, the disbelievers had succeeded in driving Prophet Muhammad SAW, may the mercy and blessings of God be upon him, and his followers out of Mecca, however, by doing so they sealed their own fate. The title comes from the mention of Prophet Muhammad's name in verse two. 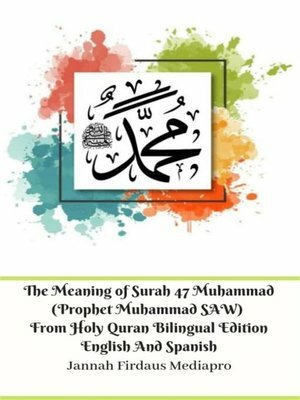 Surah Muḥammad (árabe: سُـورَة مُـحَـمَّـد, "Chapter of Muhammad") es la 47ª surah del Sagrado Corán con 38 ayat. Este capítulo de treinta y ocho versículos fue revelado en Medina. En general se entiende que los capítulos de la mediana se centran en el establecimiento de una sociedad musulmana que funcione. Este no es diferente y aborda varios temas, incluyendo la guerra, lo que les sucede a aquellos que tratan de impedir que otros se conviertan al Islam y la futilidad de oponerse a Dios y a Su Profeta. En el momento de la revelación, los incrédulos habían logrado conducir al Profeta Muhammad, que la misericordia y las bendiciones de Dios sean sobre él, y sus seguidores fuera de La Meca, sin embargo, al hacerlo sellaron su propio destino. El título viene de la mención del nombre del Profeta Mahoma en el versículo dos.